The exhibition Beyond Sound raises the issue of sound as a medium in terms of materiality and/or a language in itself at the crossover with visual arts, music and literature in the plural eyes of six artists, namely, Eddie Ladoire, María Negroni/Pablo Marín, Steve Roden, Edgardo Rudnitzky and Tintin Wulia. These artists of various nationalities work in the field of plastic arts, music or both, which is necessarily reflected in the very nature of their work. The show unfolds as a sound and visual itinerary through the different spaces of a place with an imposing architecture filled with stories about immigration in Argentina: the Hotel de Inmigrantes, the venue of the Centro de Arte Contemporáneo. 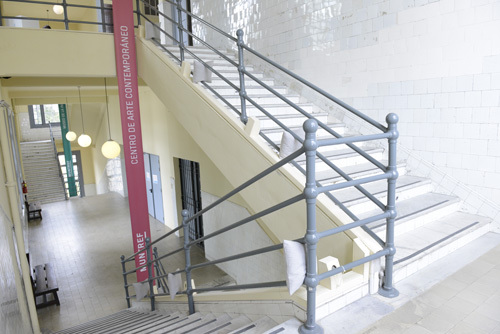 Equipped with headsets and a map made by the artist indicating different listening points, the visitor will explore and (re)discover the building. Ladoire toys with the listener/spectator, who is being unsettled by the increasingly fragile boundary between reality and fiction. The artist invites us to reconsider our relationship with sound, hearing and space. One of the essential themes of composer Edgardo Rudnitzky’s work is the exhibition of sound, i.e. giving visibility to the immaterial. Border Music is a case in point. 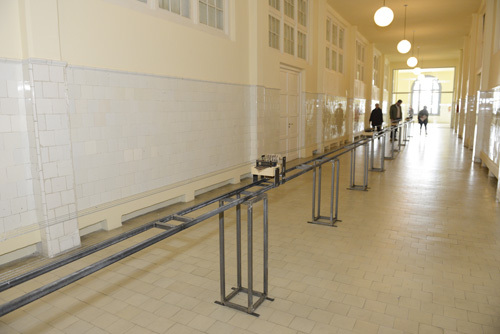 This sculpture is displayed in perfect consonance with the space architecture around it, namely, a long hallway on the third floor of the building. As this piece produces sound fragments, the first perception of this work is that of a musical instrument. However, a more attentive listening will allow the spectator to become gradually aware of the fact that the sound and the object are interdependent and that the piece is in fact a sound object. 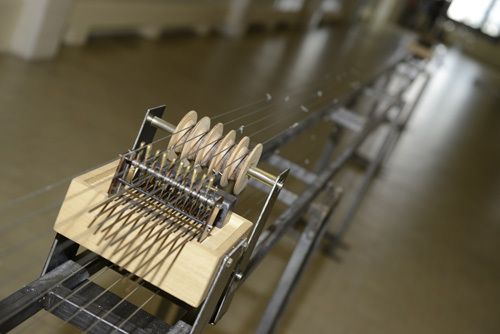 Due to its mechanism, this object writes a “musical score” that is acoustically executed in the space. The coarse physical appearance of this piece clashes with the pure nature of the sound coming from it. A sort of mismatch thus arises for the visitor, who is both a listener and a beholder. The issue of borders and the way they affect people on a personal level is a recurrent theme in the work of Tintin Wulia. In Babel, this artist resorts to various poetic texts by Middle East writers translated and recited by Indonesian poets. The poem Al Taashira (The Visa), by Egyptian writer Hisham el Gakh, represents the core of this work. These texts intrinsically address the topic of displacement and nomadism, a growing problem at the onset of the 21st century. This sound piece is a polymorphic multi-voice poetic narrative. These Arabic, Indonesian and English languages have their own sonority and texture, which converge in a sort of sound magma. Reading through audition becomes difficult, which underscores the resonance effects given to words and the volume of certain voices with respect to others. The impression of a flight from the center is rendered by this work, which invites us to a sonic and at the same time physical experience. Another poetic account is presented in the installation Angelus novus. 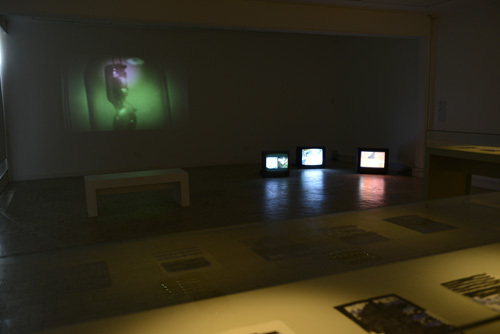 Two screens are frontally set in the space, one of which shows Pablo Marín’s black and white oneiric film accompanied by William Basinski’s music. The other displays a fragment of the text Exilium by poetess María Negroni. This Super 8 film transmits the odd feeling of an agonizing world, a dramatic intensity that the music underscores. Just like an echo, the text read by an off-screen voice tells us about exile and the resulting grief and emptiness. These elements converse with each other creating a non-linear, three-voice, unique, intimate account. In his multiple installation, visual sound artist Steve Roden also establishes image and text interaction games, where the sound representation is intrinsic to each piece. Striations alludes to the production of sounds that evoke primitive rituals, such as banging together stones or other acoustic objects. In Es oh yu en dee, images from educational films from the 1940s and the 1950s teach children to open up to the universe of sound. In both silent movies though, images play a key role in the evocation of sound. In Disorder and Line and Faces the soft sounds appear as phantasmagoric presences. Each piece seems to echo the preceding video or the questions arising from them, as though each gesture, language or medium led to another door. The use and the conflicts concerning language and words are of paramount importance in Water Music (Drumming) and Cascade. In the scores of Water Music, sounds and words are equally significant and constitute diverse ways for their execution and interpretation. In Cascade, the text draws its inspiration from the 1962 song Le Rythme de la pluie. Translated into different languages, these texts provide multiple sonorities and reading modalities. Steve Roden creates both a unique space for a diversity of works echoing one another and elements of a score for a sensitive experience that lends itself to individual interpretations. The architecture, the acoustics, the size of the spaces and the historic context are all elements in resonance with the pieces selected for this exhibition. As they wander around, the spectators are confronted with their own perspective habits to open up to new cognitive and sensorial experiences.